Something struck me when I saw the closing dialogue of the movie Evan Almighty; I got out of the writer’s block and started to finish this post. It’s easy to imagine that the ‘Ark’ in the Arkesh’s name stands for Act of Random Kindness. I have known him for a sometime now – as Praks father, soft spoken and charming, he always made you feel good about yourself after you had met him. So when I met him last Dec and spoke with such fervor about his farm off Mysore road, I made a note to myself to visit sometime. We started from Bangalore at around 7, Mysore road was expectedly busy, although it was second day of a long weekend. We drove in my Elantra, stopped at Kamath for the buffet breakfast. The drive after we got off the highway was the best, we rolled the windows down and let the countryside air fill our lungs. It was about 11 when we reached the Kalyani at the bottom of the Melukote hill. After the must-do photo shoot at the pushkarni, we started to climb up the hill to the Yoga-narasimha temple. It was blazing hot and the climbing the all the steps up to the teimple was not easy. We also visited the Cheluvanarayana temple. It was packed with sweaty devotees and ‘devotion’ was definitely not top of mind when I got a glimpse of the deity. I never thought we could make it with those directions, but they were spot on and more accurate than the GPS (sloppy benchmark to start with). It was right at the end, that we overshot the farm, thanks to Raghu’s misleading gut-feel and our not-so-local-language-conversant co-pilot, Dhannya. The Elantra was subject to a lot of abuse from the road (or the lack of it), but I was proud of the way it handled the terrain meant for the 4x4s. We had absolutely no idea what to expect when we reached the farmhouse. But as soon as parked there, we started to breathe, see and eat... Mangoes. It’s a 50acre farm – a 1000 mango tress and some delicious varieties – Alphonso (Badami), Raspuri, Totapuri, Kari raspuri and a few local ones. 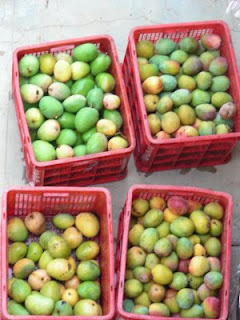 In the middle of the harvesting season, each tree had nearly about 100 mangoes to be picked. Kenchegowda was the caretaker of the farm, was out to graze cattle. 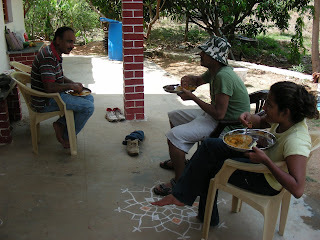 But his wife and kids and Chandrappa made sure we were comfortably settled in the rooms in the first floor of the farmhouse after a guided tour of the farm. Mango Harvesting: Thanks to movies and beverages, we woke up late and plans of trekking to Devarabetta or Kabaaladurga had to put to shelved for another day. Arkesh uncle came there in the morning and everyone got on their feet (everyone, except Raaji). After a quick breakfast, the mango harvesting began. 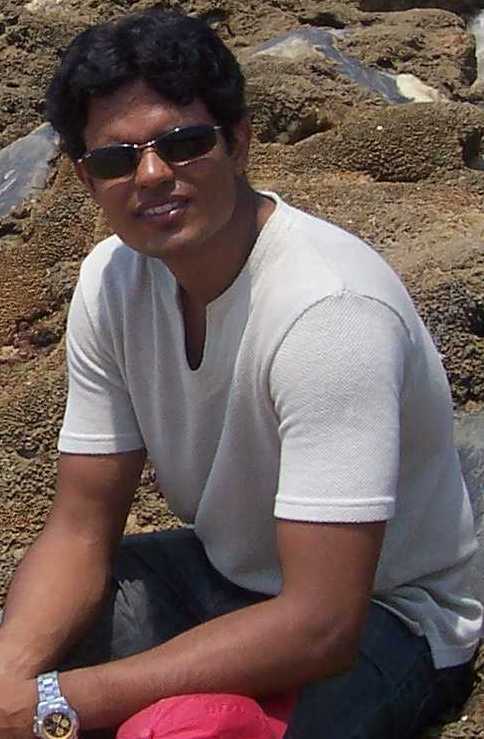 While Raghu and I joined the team and were soon finishing off an entire tree ourselves. The words - first time right, low hanging fruits and sap actually meant what they were and not some business jargon. Arkesh uncle taught us how to harvest, to keep the sap from burning our fingers or the fruit. It was a relaxing exercise – starting off with an empty carton and a full tree and finishing off with a full carton and an empty tree. The repetitive act of picking the mango to go for next, carefully plucking it at the right spot, placing it gently in the carton and back till the entire tree is cleaned up, and just doing this over and over again, is what brings to it an element of relaxation. Raghu and I got back to lunch after a while, but Arkesh and team kept to the task till we had some 60 odd cartons, all treated with Ethylene (? ), loaded and ready to make it to Metro. 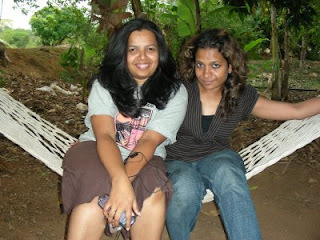 The girls were having a ball too, sharing the machaan (hammock) and some gossip, am guessing!! All’s well, but it really didn’t end well. What with the traffic on Mysore road at the end of a long weekend! “God: How do we change the world? Evan Baxter: One single act of random kindness at a time. I am fascinated to visit the One Act of Random Kindness Place. Do you have any contact number of Arkesh Farm so that i can do any booking if needed. @Ashish - Unfortunately, it is not open to public. There are some nice trails for moutain biking, hiking, etc.